Prohibited to you are dead animals, blood, the flesh of swine, and that which has been dedicated to other than Allah , and [those animals] killed by strangling or by a violent blow or by a head-long fall or by the goring of horns, and those from which a wild animal has eaten, except what you [are able to] slaughter [before its death], and those which are sacrificed on stone altars, and [prohibited is] that you seek decision through divining arrows. That is grave disobedience. 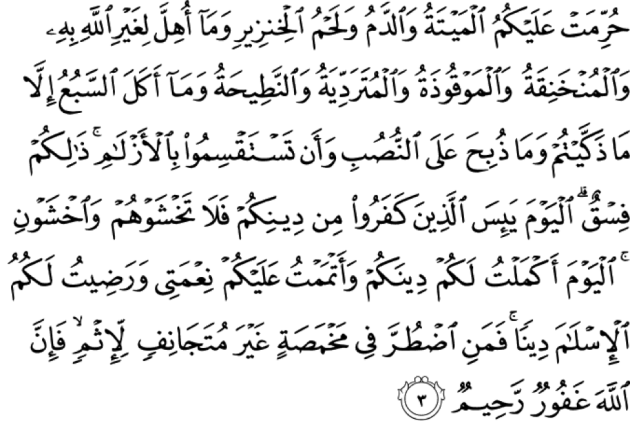 This day those who disbelieve have despaired of [defeating] your religion; so fear them not, but fear Me. This day I have perfected for you your religion and completed My favor upon you and have approved for you Islam as religion. But whoever is forced by severe hunger with no inclination to sin – then indeed, Allah is Forgiving and Merciful. (and that which has been killed by strangling…) either intentionally or by mistake, such as when an animal moves while restrained and dies by strangulation because of its struggling, this animal is also unlawful to eat. (and that which is sacrificed on An-Nusub. ) Nusub were stone altars that were erected around the Ka`bah, as Mujahid and Ibn Jurayj stated. Ibn Jurayj said, “There were three hundred and sixty Nusub ﴿around the Ka`bah﴾ that the Arabs used to slaughter in front of, during the time of Jahiliyyah. They used to sprinkle the animals that came to the Ka`bah with the blood of slaughtered animals, whose meat they cut to pieces and placed on the altars.” Allah forbade this practice for the believers. He also forbade them from eating the meat of animals that were slaughtered in the vicinity of the Nusub, even if Allah’s Name was mentioned on these animals when they were slaughtered, because it is a type of Shirk that Allah and His Messenger have forbidden. (This day, I have perfected your religion for you, completed My favor upon you…) `Umar replied, `By Allah! I know when and where this verse was revealed to Allah’s Messenger . It was the evening on the Day of `Arafah on a Friday.”’ Al-Bukhari recorded this Hadith through Al-Hasan bin As-Sabbah from Ja`far bin `Awn. Muslim, At-Tirmidhi and An-Nasa’i also recorded this Hadith. In the narration collected by Al-Bukhari in the book of Tafsir, through Tariq, he said, “The Jews said to `Umar, `By Allah! There is a verse that is read by all of you (Muslims), and had it been revealed to us, we would have taken that day (on which it was revealed) as a day of celebration.’ `Umar said, `By Allah! I know when and where this verse was revealed and where the Messenger of Allah was at that time. It was the day of `Arafah, and I was at `Arafah, by Allah.” Sufyan (one of the narrators) doubted if Friday was mentioned in this narration. Sufyan’s confusion was either because he was unsure if his teacher included this statement in the Hadith or not. Otherwise, if it was because he doubted that the particular day during the Farewell Hajj was a Friday, it would be a mistake that could not and should not have come from someone like Sufyan Ath-Thawri. The fact that it was a Friday, is agreed on by the scholars of Sirah and Fiqh. There are numerous Hadiths that support this fact that are definitely authentic and of the Mutawatir type. This Hadith was also reported from `Umar through various chains of narration. (But if one is forced by necessity without willful disobedience nor transgressing due limits, then there is no sin on him. Truly, Allah is Oft-Forgiving, Most Merciful.) Some scholars used this Ayah as evidence that those who travel for the purpose of committing an act of disobedience are not allowed to use any of the legal concessions of travel, because these concessions are not earned through sin, and Allah knows best.